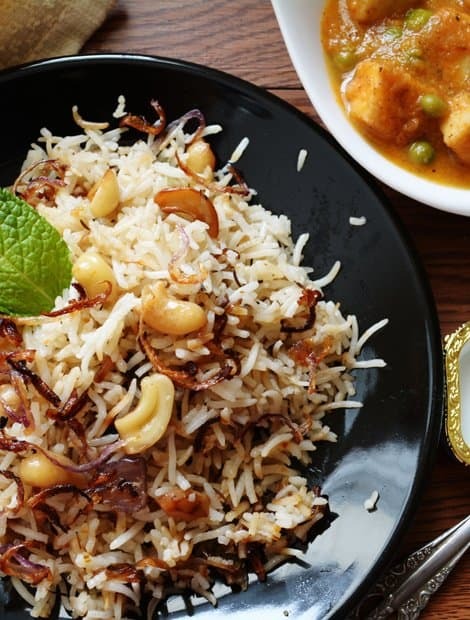 Bagara Rice is a flavorful version of rice made with Basmati rice and fried onion. This recipe is from popular Hyderabadi Cuisine from India. Which is known for its unique rich flavored non vegetarian dishes. This cuisine has got the influences of Arab, Mughal and Indian cuisine. Bagara rice is so simple and easy to make still taste like made by professional chef. This is not much popular in the regular Indian restaurants in United States. But of course you may get it in the restaurants for Andhra cuisine or in the restaurants for Hyderabad cuisine. You don’t need to search for the restaurants to eat this food as you can make it by yourself in your kitchen. In the comfort adjusting the flavors to your preferences. Bagara rice with sprinkled fried onions on the top…yummm..without any further thinking, I can surrender myself. I bet you this rice could be better dish for weeknight dinner. The perfect combo for this Bagara rice would be Indian Bagara Baingan.. But today I made Paneer mutter Kurma. The result.. as you were expecting, my family, waved their hands to say a Big Yes. To get perfect results for the Bagara rice, few things to be kept in mind every time and all the time. First, while frying onions, make sure it should not get burnt. There is a thin line between crispy onions and burnt onions. So be careful in this part. Second, getting a perfectly cooked basmati rice, though it depends on the quality of the rice most of the time. If you are looking for other rice recipes, then do check Capsicum rice, Szechuan Fried Rice, Chitranna rice. Bagara Rice is a less spicy version of Indian Biryani. If you are running out of time or wish to make simpler everyday food, then this recipe might be your best choice. Though it is simpler to make, it is equally as good as Biryani. A spicier accompanied side dish elevates the flavor this Bagara Rice. According to Wikipedia “Bagara rice is a spiced rice delicacy. 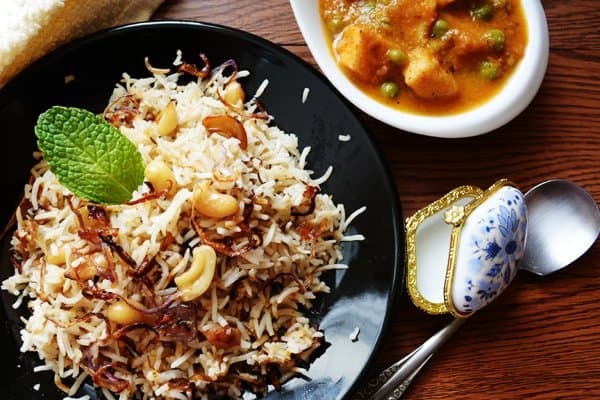 A plain Biryani recipe made without spice or vegetables.” And this is great for the vegetarians who do not prefer to have non-vegetarian biryani. It gives the full satisfying feeling of having special biryani still made in a vegan way. 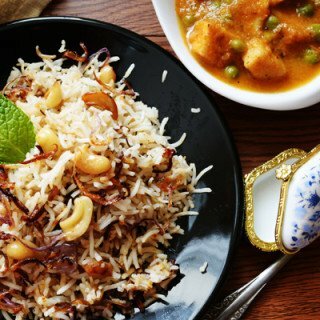 The main ingredients for this recipe are the basmati rice, fried onions and Shahi Jeera. Thanks for the increasing popularity, now available in almost all the grocery shops. You can choose your favorite one white basmati rice or brown basmati rice and both equally tastes good. The onion is the staple in all in almost all the recipes of Indian cooking. I never can think of any Indian recipe without onion. And this recipe requires lot more onion than any regular rice recipe. I really love the flavor of fried onions here which does bring the beautiful smoky flavor. Which also makes Bagara rice so DELICIOUS! Feeling tired or you have less time for dinner? no worries you may skip frying the onion instead use fried French onions. Shahi jeera this is an unique seed which belongs to the family of cumin. You may get it in the in your nearby Indian stores or online store. Or you may skip it. Can we make Bagara rice in the electric cooker? Yes, you can. And the end result would be amazing. Making with electric cooker is a foolproof method. You always get that long grained rice without messing or straining too much for the perfection. Follow the same principle and method for cooking plain rice to make this Bagara rice recipe. Electric cookers are the same as instant pot so I do all the frying part on the Stove. I just allow the rice to cook in the rice cooker. If you are using the electric rice cooker, you can skip the important and crucial part of cooking which is “DUM”. And this is a foolproof method of making biryani without having to worry about Dum. Can I make Bagara rice in instant pot? I have recently discovered that making rice recipes is the easiest thing to do in the instant pot. Cooking Hyderabadi Bagara rice recipe is as same as making cooking regular rice. The same water measurement and the cooking time would be perfect for this Hyderbadi rice. Like any other rice recipe, you can also make this in instant pot, where all the frying part should be done over the stove top. This way you can achieve uniformly crispy onion. Personally, I hate frying anything on instant pot. Because of the fumes that just creates while frying. And this cooking oil flavor is overpowering and fills the entire home. I really cannot withstand the smell. And this is the only reason that keeps avoiding me anything in the instant pot. I always find easy ways are shortcut methods. And I’m searching for easy solutions for a long time. If I find anything successful, I’ll just come here and will let you know let you all know about this. Can you make Bagara rice with coconut milk? Yes, you can include coconut milk in the Bagara rice Hyderabadi recipe. Adding coconut milk yields richer and flavorful rice. If you are planning to use coconut milk, then substitute half of the required water with coconut milk. For instance, if you adding two cups of water, then add 1 cup of water and 1 cup of coconut milk. Clean and wash basmati rice. Washing just 2 times helps in retaining the flavor of the rice. Soak basmati rice for 20 minutes. Do you really need to soak the rice? yes, soaking the rice would help to get elongated and soft rice. We always soak the rice prior to its cooking. Thus we get long grains all the time. Meanwhile, In a nonstick pan, liberally add oil. Followed by thinly sliced onions. Fry them till they become crisp and golden brown in color. Do not crowd the pan and fry them in batches. Then fry broken cashews at the end as the final batch. Drain the leftover used oil if any. In the medium flame and in a pan, add oil and butter. Then add shahi jeera, cinnamon, cloves, bay leaves, black cardamom, green chilies. Once all these ingredients become golden brown, add ginger garlic paste. Saute for few seconds. Now add green chilies and mint leaves. Again saute for few seconds. Make sure that nothing gets stuck at the bottom of the pan, adjust the heat accordingly. Add 2 cups of water along with salt. Once the water started boiling add rice. Allow the rice to get cooked for 5-7 min. Once the rice 3/4th done, add fried onions and cashews. Cover an airtight lid. And in simmer flame allow it to cook for 10 minutes. Remove the lid and serve with spiced side dishes. Now perfect Hyderabadi Bagara Rice is ready. Bagara Rice is from famous Hyderabadi Cuisine, very flavorful and tastes delicious. Made with basmati rice and fried onion. This recipe is quick and easy made under 30 minutes. Clean and wash basmati rice. Soak the rice for 15-20 min. In a nonstick pan, add oil and onions slices. Fry them till they become crisp and golden brown. Then fry cashews. And keep aside. In the same pan, add both oil and butter. Then add shahi jeera, cinnamon, cloves, bay leaves, black cardamom, Serrano peppers. Fry till these ingredients become golden brown. Now add ginger garlic paste and saute for few seconds. Add green chilies and mint leaves. Again saute for few seconds. Now add 2 cups of water along with salt. Once the water started boiling add rice. Allow the rice to get cooked for 5-7 min. Once the rice 3/4th done, add fried onions and cashews. Cover an airtight lid. And in simmer flame allow it to cook for 10 minutes. Our family loves more fried onions If you wish you can reduce the quantity of fried onion too. Add vegetables like peas, potato, carrot, and cauliflower. Which makes it a healthy variation. Instead of basmati rice, you may also substitute with brown rice, jeera rice or your regular rice. Looking for another mixed rice varieties? check out, Soya Chunk Biryani, as well. Liked this easy recipe? Then Follow us on Facebook, Pinterest, Instagram and Do not miss latest recipes and its tips. wow loving this simplified version of biryani 🙂 looks very inviting dear ! !